Here are some of the close partners, restaurants, and services that are part of the Create Wellness Center Community. All are available in English unless otherwise specified. Healthy pre-made paleo meals made by athletes, for anyone who wants to have healthy and delicious meals. Delivers all over Seoul, and pickup is available at Create Wellness Center. Delicious vegan meals and desserts, available for pickup in Haebangchon or delivery. The brainchild of a holistic nutritionist, perfect for busy people who want to eat healthy meals on the go, or for those looking for vegan meals in Korea! Vegan restaurant and bakery in Itaewon, recently opened a larger location right next to Itaewon station and close to Create Wellness Center! Our favorite Italian restaurant; authentic recipes, casual atmosphere, great wine, and charming waitstaff. Highly recommended. Located just a couple subway stops from Create Wellness. Mexican Fusion restaurant that started in Itaewon and now has multiple locations in Korea and Singapore; for good reason. A great place to meet with friends over drinks– we recommend the chili lime shrimp tacos! Shuttle Delivery provides delivery from a variety of Seoul, Busan, and Pyeongtaek’s best restaurants so you can enjoy the best food in the comfort of your home, office, or wherever you happen to be! 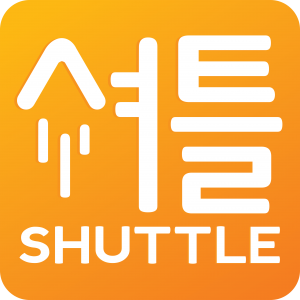 Shuttle offers a fully bilingual service where customers can place orders in either English or Korean (한국어). Bilingual certified counselors; mental health services for expats, international insurance accepted. Virtual concierge service for expats that is run via Kakaochat. Ask for help with virtually any service or product available in Korea! High quality, vegan, Illite based Soap. Highly recommended and used by our staff. Produced locally in Korea! Located close to our clinic in a community facility called Micook Oppa, Beau Walder runs a high quality men’s barbershop after sharpening his skills for years in both the UK and Australia. Highly recommended (and the pictures on his facebook speak for themselves as well). The go-to guy for any computer related issue, whether it be sales or technical service. Impeccable customer service. Emily Doran runs an organization dedicated to rescuing abandoned shelter dogs and helping to find owners in Korea or abroad. Located in Itaewon and always in need of more adopters and supporters! 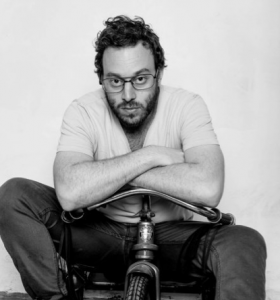 “WeWork is a platform for creators. We provide the space, community, and services you need to create your life’s work.” Watch for regular community events that Create Wellness Center holds at Wework Gangnam! Previous events have included a Spring Wellness Fair and Office Ergonomics Workshop. A great networking event run by Todd Sample, for both foreigners as well as Koreans; a varied demographic of people who gather to enjoy good wine and conversation. Held in different locations around Seoul on a monthly basis. Running club for expats with regular meetings and events. A great way to connect with other runners and prepare for athletic events! Maitri’s purpose is to capture the candid moments & intimate emotions specific to your family. She’s all about clean edits, true colours and stunning black and white images that will transform your special moments into memories. Check out her facebook page, to learn what her clients have to say about her work or to view her portfolio. Brilliant local artist and cartoonist who captures scenes of modern Korean life; recently featured in Groove Magazine. 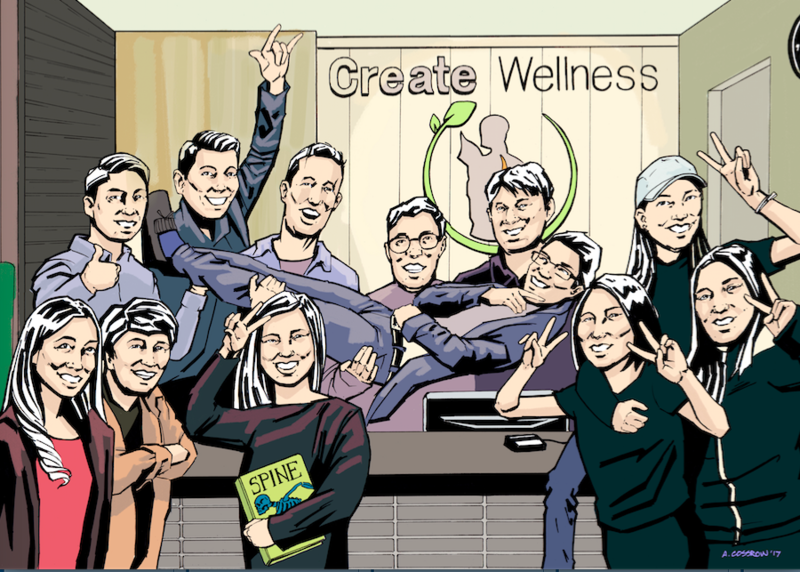 Drew the cast of characters of Create Wellness Center hanging out at the front desk! Oriental Brush paintings with a modern twist from our manager Sunjae Lee. Easily transportable scroll paintings that are perfect as a memento of your time in Korea!